Near the end of the last century, I visited the Cambridge home of the late Nicholas Guppy. He and his wife Anna were most accommodating, especially since their cottage was filled to the brim with extensive collections. Nicholas was descended from Amelia Elizabeth Guppy (1808-1886), a wonderfully mercurial early photographer, notorious as much for her independence as for her paintings and her fearless and innovative approach to photography (and before you ask, the aquarium fish was named after her son, its discoverer – but since that story involves tattoos and the daughter of a chieftain, we’ll save it for another venue). Some of her most intriguing 1840s photographs were done for Henry Talbot’s friend, Sir Thomas Phillipps, and these came into the possession of the late Harrison D. Horblit as part of his Phillipps-mania. Horblit’s collection was donated by his widow to the Houghton Library at his alma mater of Harvard and since I had known Harrison, their Librarian Roger Stoddard asked me to contribute to a March 1999 symposium celebrating the opening of Horblit’s collection. Harrison had intrigued me with the enigmatic photographic work that Amelia had done for Sir Thomas and she seemed the obvious choice for a subject. Unfortunately, after her death most of Amelia’s artwork was left in her home in Trinidad – just like so much early Australian photography on paper, it proved tasty to hordes of white ants. Nicholas had salvaged much of what had survived. Sadly, amongst the treasures, he could not locate any photographic portrait of her. Shortly after the symposium, the Houghton published some of the talks in Six Exposures; Essays in Celebration of the Opening of the Harrison D. Horblit Collection of Early Photography and Amelia took her place in there. Last year, our blog contributor Rose Teanby started researching Amelia Guppy for her new Early Woman Photographers website. 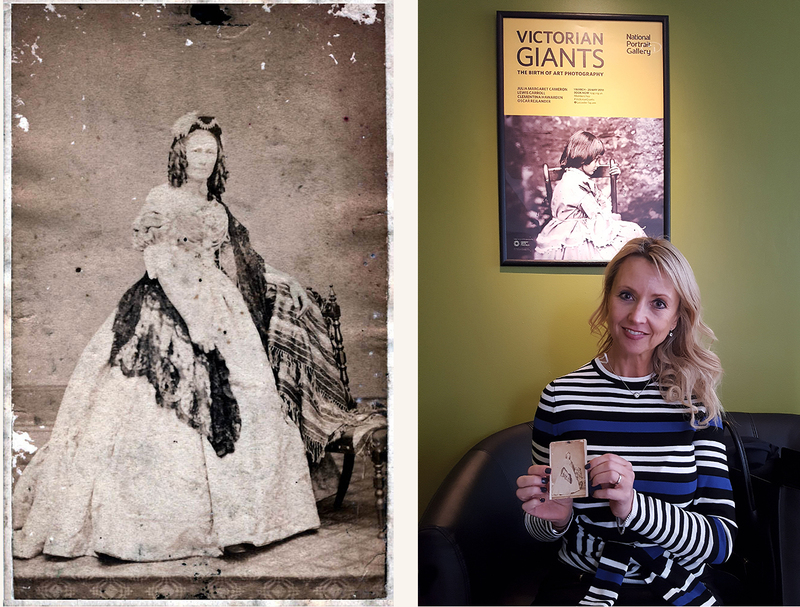 In coursing through extended branches of descendants, she came upon news that a carte-de-visite of Amelia had turned up in a family collection in South Africa. It is not much to look at – the white ants apparently had a go at it – but it depicts the very sort of determined woman that I had learned Amelia to be. Through the efforts of Rose and the generosity of the family, London’s National Portrait Gallery now has a photographic representation of this remarkable photographer. Exactly a week ago today, Patricia Guppy, having hand-carried the portrait from South Africa, presented it on behalf of the family to the Photographs Collection at the NPG. My personal thanks to the family and to Rose. The NPG’s Clare Freestone said that “we are delighted to accept this generous and important gift. We are proud to be able to represent such a significant and early woman photographer in our Collection which has a strong representation of women photographers.” The inclusion of the poster behind Mrs. Guppy is intentional, for on 3 May Rose will be delivering a lecture at the Gallery, “Who was Britain’s First Female Photographer?”, as part of the Victorian Giants: the Birth of Art Photography exhibition. If you want to study up on Amelia Guppy in advance of Rose’s lecture, in light of the fact that Six Exposures is long out of print the Houghton Library has kindly released a downloadable pdf of my article. A recent blog slipped in some more of the photographs done by Talbot’s colleague and friend, the Reverend Calvert Richard Jones (1802-1877). 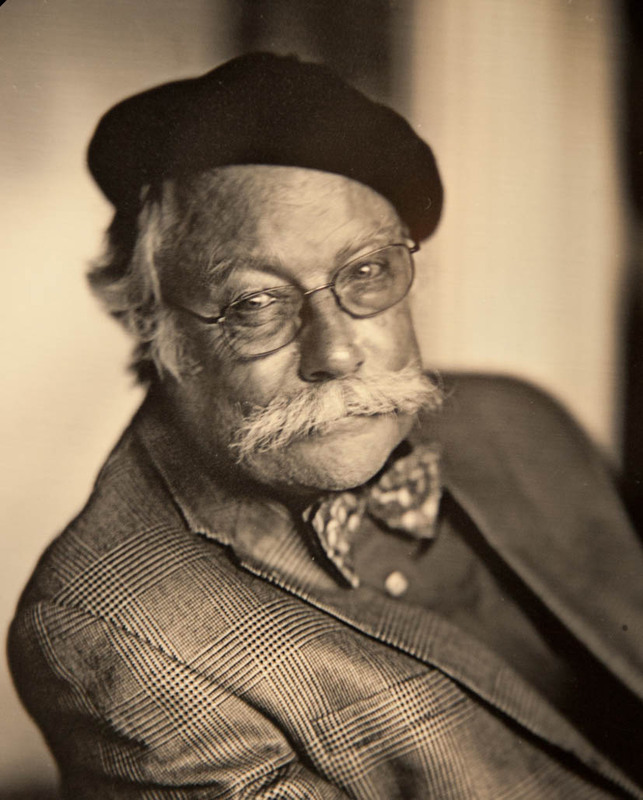 Jones was critical to supplying Talbot with negatives that could be turned over to Nicolaas Henneman to publish for profit, first out of his calotype establishment at Reading, later from his studio in London. We have included Calvert Jones in this Catalogue Raisonné precisely because so many of his photographs have been confused in the past as being by Talbot. That is understandable, for Jones took his tutelage from the master and did very well with it. When Henneman’s London operation started to go under in the late 1850s, he owed quite a sum of money to Talbot, a situation difficult and awkward for both men. Henneman had been enormously brave to leave Talbot’s employ and declare his confidence in the new art. Talbot, as a gentleman, felt a lifelong obligation to his former servant. I cannot prove it through documentation (which probably never was written down), but I am absolutely convinced that Henneman contributed his old stock to Talbot as partial repayment of debt. Over the generations, the work of Jones and others became blended into the massive Lacock Abbey collections. In 1934, when Miss Matilda Talbot generously gave so many thousands of images to the Science Museum, a goodly portion of the ‘Talbots’ were in fact by Jones and others. Research in recent years has started to separate these out, but since so many exist in the literature as a Talbot, they are included within this project. Now, I don’t know how many of you have noticed, but Brian Liddy and Jaanika Vider have greatly ramped up the posting of images to the skeletal tree of information on the Catalogue Raisonné – this week the total number of images available hit 11,513. Of course, it is nose to the grindstone and they are strictly prohibited from having any intellectual fun whilst adding to this total. But they have managed to slip in more than a few questions and observations, sometimes putting my creaky but reliably rich old DOS databases and files to the test. Recently a number of these queries have been about Calvert Jones. I used to work with shoeboxes full of snapshots of Talbot photographs seen on visits throughout the world, so today’s ability to see and manipulate vast numbers of digital images on a monitor is undoubtedly fabulous. But there is a drawback to this, for sense of any sense scale is subordinated to the convenience of the display. These images had been assigned two different Schaaf Numbers in the system, which at first glance appeared to be a mistake, for allowing for variations in density and cropping, they are all one and the same, aren’t they? 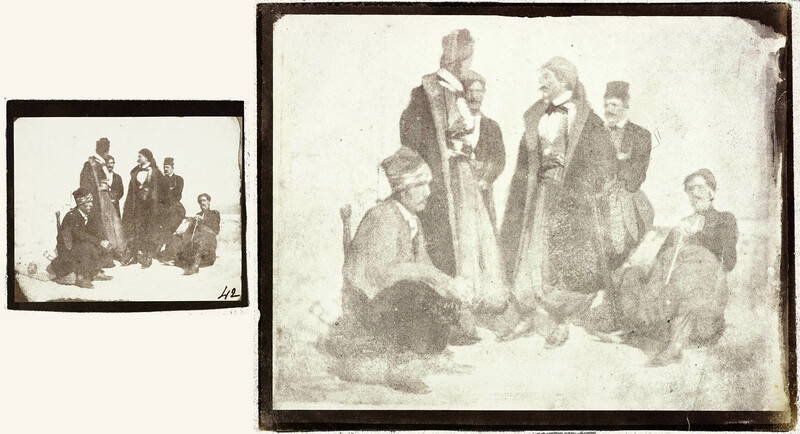 Actually not, for while they are clearly the same image, one is a quarter-plate in size (8.1 x 9.6 cm.) and the other whole-plate (16.7 x 21.8 cm.). Now, with today’s smartphones, we are used to the ‘pinch’ feature where we can enlarge images at will. In the antediluvian days before the flood of digital technology, photographers took to their darkrooms, popped their negatives into an enlarger and printed to whatever size they desired. However, in era of Talbot and Jones, contact printing was the most practical and almost universal approach. Talbot was well aware of the power of the camera to alter the scale of the real world, either magnifying a slice of coral 400 times, or reducing a large Italian print down to a more convenient size. Solar enlargers that would enable a negative to be printed to different scales would come later. Calvert Jones apparently felt the need to experiment with different print sizes, so in a number of cases he produced a copy negative, reproducing the original but on a different scale. How did he accomplish this? 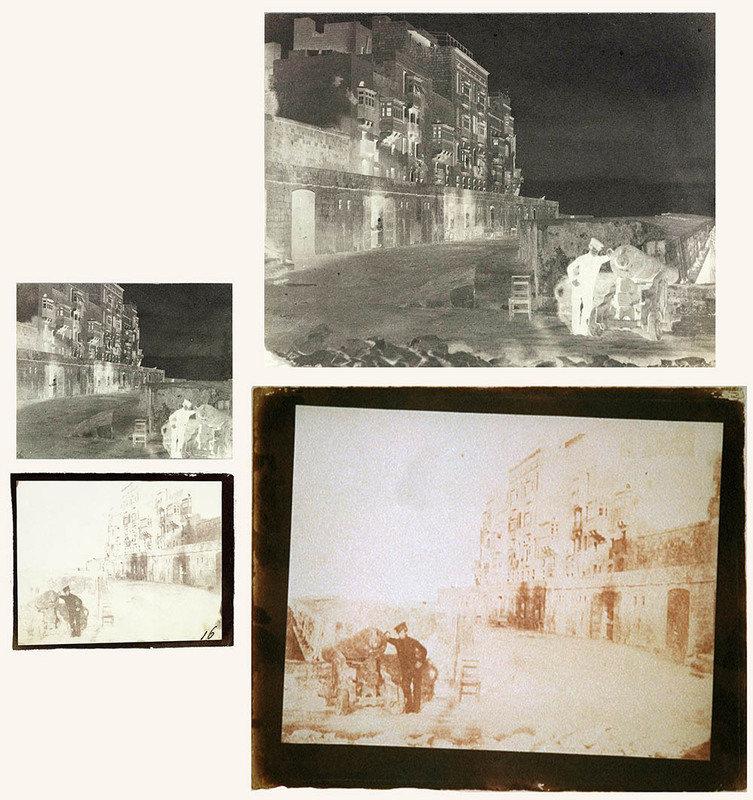 If he only needed a single altered print, he could put an original negative in front of a camera and adjust the distance to either enlarge or reduce the original. Of course he would be creating a new negative, but it would be a negative of a negative, so the new one could be a positive single print on a different scale. This could be repeated to make several prints. In the early days of sound recording, the singer might have to repeat their performance again and again, cutting a new wax cylinder each time (or they could face a bank of them at once). 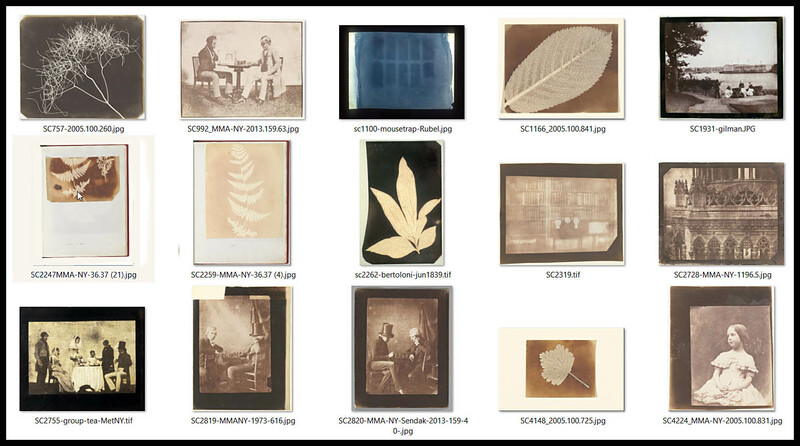 With the calotype, a more practical scenario would be to make a contact print from the original negative and then photograph that print, again adjusting the camera to produce a negative of the desired size. The new negative could then be printed as much as desired, yielding prints of a different dimension. As attractive and simple as this latter approach might have seemed, it was not without its drawbacks. Inevitably, especially with the coarse texture of the paper base, there would be a loss of sharpness and detail in making a print – that is why Talbot was initially more fond of his original negatives than of prints made from them. If one first made a print, the copied the print in a new negative, there was a doubled loss of sharpness, readily evident in the copy. Now, we like to keep our angels dancing on the heads of their pins, so please indulge me in another of the internal challenges in posting the Catalogue Raisonné. Unique institutional numbering systems can provide some complexities for our cataloguing. In some cases, older manual numbering systems proved difficult to migrate into the digital age and the owners migrated to differently formatted numbers, sometimes cross-referencing with the old numbers, sometimes simply tossing them. Some systems are downright quirky (to my taste) – one system incorporates code numbers for both the photographer and the storage size into the inventory number – if a photograph is re-attributed, or matted in a larger matte, the number changes. Those of you that have been noticing the entries from the substantial collection donated by Miss Matilda Talbot to the Science Museum in 1934 and now in the National Science and Media Museum, Bradford, might have observed that they often hold a number of examples from the same negative. Although the collection came into the museum in 1934, it was group accessioned in 1937, so all their numbers have the format 1937-xxxx. When we finally item-level catalogued the collection in 1994, every new item-level record kept the root of 1937-xxxx. In many cases they are fortunate enough to have several prints from one negative, which led to stroke numbers for each – 1937-2656/11 for example. But the above three are exceptions to the system, 1937-387/1, 1937-387/2, and 1937-387/3, for they clearly are not from the same negative. That anomaly resulted from some photographs being item-level catalogued at some point in the period between 1937 and 1994, perhaps for an exhibition or publication. The ruling was that these numbers, once in the system, had to stay. The Schaaf numbers are meant to transcend any institutional numbers, original or changed, and to tie together the negative and all of its prints, or to uniquely identify a single negative or print, no matter where each item resides on the globe.. Thus, the above all have their own unique Schaaf numbers, while each record also preserves the owner’s numbering. Now, go back to enjoying all the new images that are being posted. • Questions or Comments? Please contact Prof Schaaf directly at larry.schaaf@bodleian.ox.ac.uk • Unknown photographer, Amelia Guppy, albumen carte-de-visite, ca, 1860, now part of the Photography Collection at the National Portrait Gallery. Photograph of Patricia Guppy by Dr. Gerlind-Anicia Lorch. • There are two main sources of information on Jones. Rollin Buckman’s The Photographic Work of Calvert Richard Jones has very useful thumbnails of much of Jones’s work (London: Science Museum, 1990). Substantial documentation and perhaps a bit more precise biographical detail is in my Sun Pictures Catalogue Five: The Reverend Calvert R. Jones (New York: Hans P. Kraus, Jr., 1990). • The monitor display is from a portion of the holdings for the Metropolitan Museum of Art, New York. • Calvert R Jones, 42. Group of Greeks, Malta, calotype negative, National Science and Media Museum, Bradford, 1937-4724 /salted paper print from this negative, 1937-4663; Schaaf 3097 / Jones, 29. Group of Greeks, salted paper print derived from the previous, 1937-4659; Schaaf 4047. • Calvert R Jones, 42. Group of Greeks, Malta, salted paper print, NSMeM, 1937-4663 / Jones, 29. Group of Greeks, salted paper print derived from the previous, 1937-4659; Schaaf 4047. • Calvert R Jones, 16. Strade Marse Muscetto, Malta, calotype negative, NSMeM, 1937-4702 / salted print from this, 1937-4704, Schaaf 3486 / 18. In the Strade Ponente, Valetta, calotype negative, NSMeM 1937-1967; salted paper print from this, J Paul Getty Museum, 84.XM.1002.17, Schaaf 2993. The conflicting titles are Jones’s own. • Details from calotype negatives above. • Calvert R Jones, 83. Ponte Vecchio, Florence, 2nd Series, salted paper print from a calotype negative, 1937-387/1, Schaaf 3160 / attributed to Benjamin Cowderoy, Reading Establishment (left half of panorama), salted paper print from a calotype negative, 1937-387/2; Schaaf 1596 / attributed to Benjamin Cowderoy, Reading Establishment (right half of panorama), salted paper print from a calotype negative, 1937-387/3; Schaaf 1596.